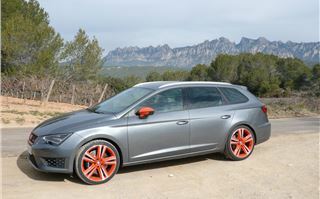 Ford did if first with the Focus ST estate and now, in a confusion of nomenclature, SEAT has done the same with its Leon ST Cupra. 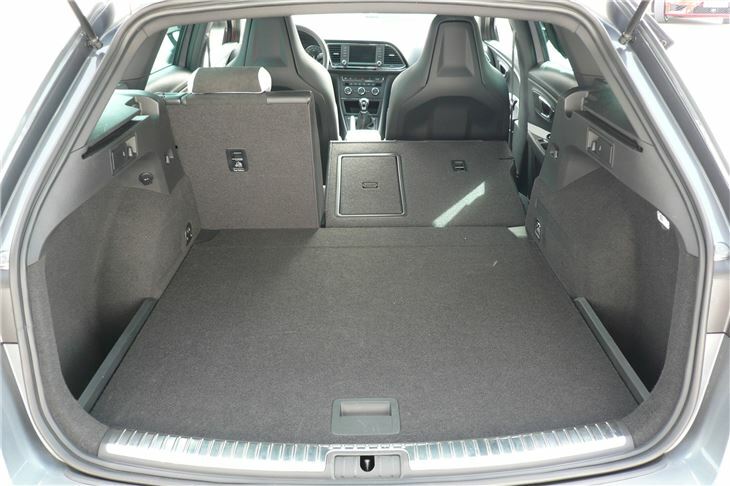 The difference is 30 extra PS, and 111 more litres of load space. Enough for the SEAT to outdrag as well as outbag the Ford. It’s so quick that, without the rucksack on its back, a standard Leon Cupra SC was the first hatchback to circumnavigate the Nurburgring Nordeschleif in under 8 minutes. 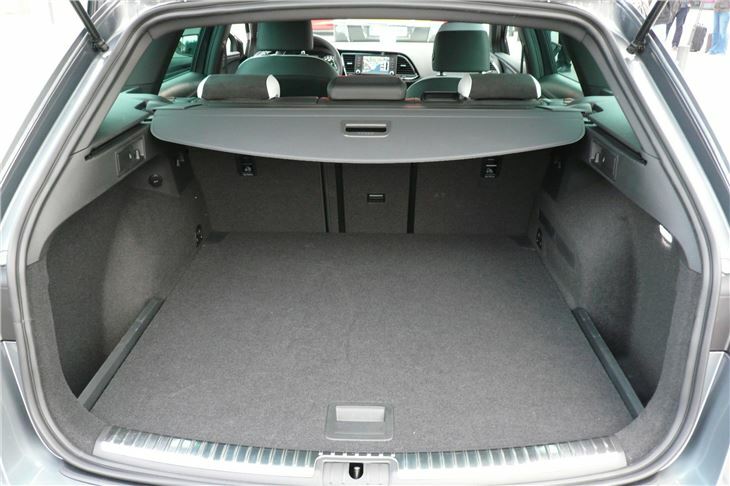 That’s a standard production car you can buy, not a stripped out special with plastic windows and no rear seats. As always, beauty is in the eyes of the beholder, but of VAG’s three mid-range estates I rate Leon best, Golf second and Octavia third. 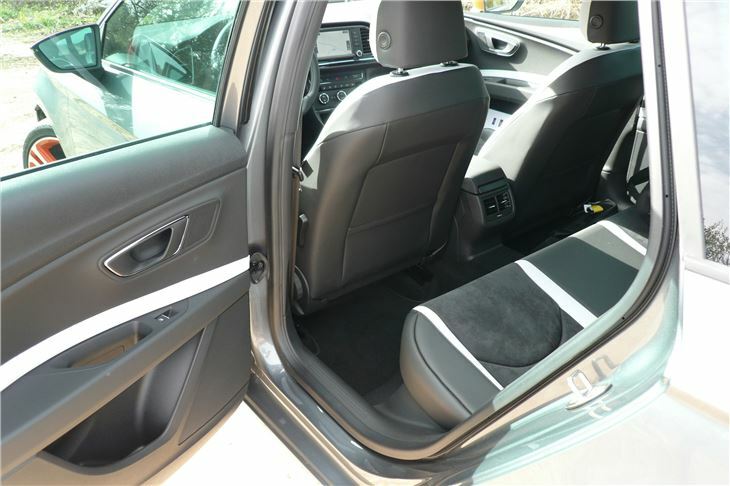 The unique twin swage lines make the Leon particularly attractive. 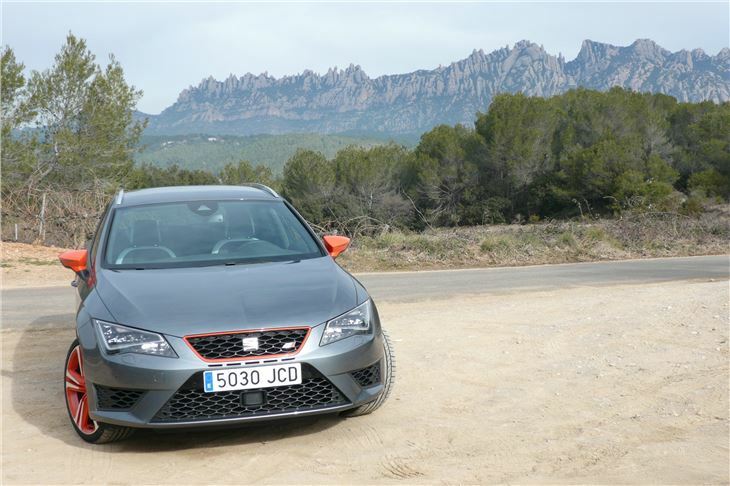 And the public seems to agree because the Leon has become SEAT’s best selling model, boosting the company back into profitability. Apparently, the ST is slightly more aerodynamic than the 3-door SC and 5-door hatch. Enough to give it a very slight top speed advantage, meaning it could probably lap the Nordeschleif almost as quickly as the SC, despite a 70kg weight penalty. 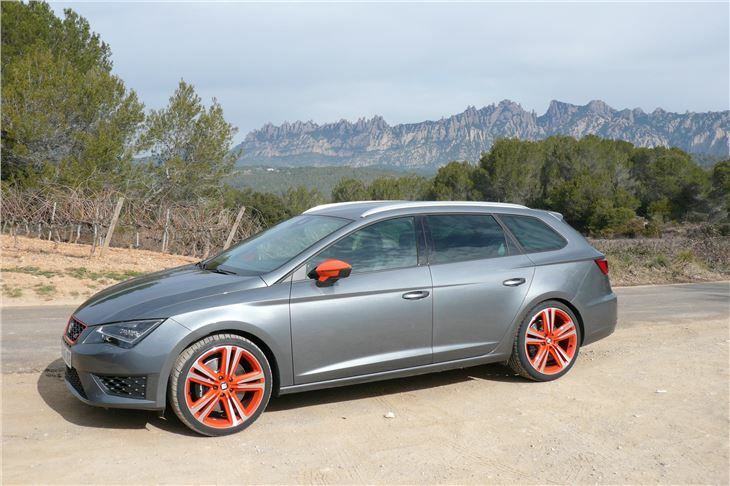 Obvious competitors apart from the Focus ST estate are the 220PS Skoda Octavia VRS, the new Renault Megane 220GT Sport Tourer and the forthcoming four wheel drive 300PS VW Golf R estate. 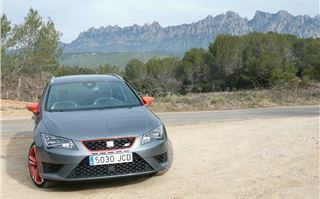 But none of these were developed by Jordi Genet, SEAT’s driver who cracked the magic 8 minutes around Nurburgring. He fine-tuned the very special multi clutch limited slip diff that gives astonishing front-end traction. The harder you push, the better it gets. 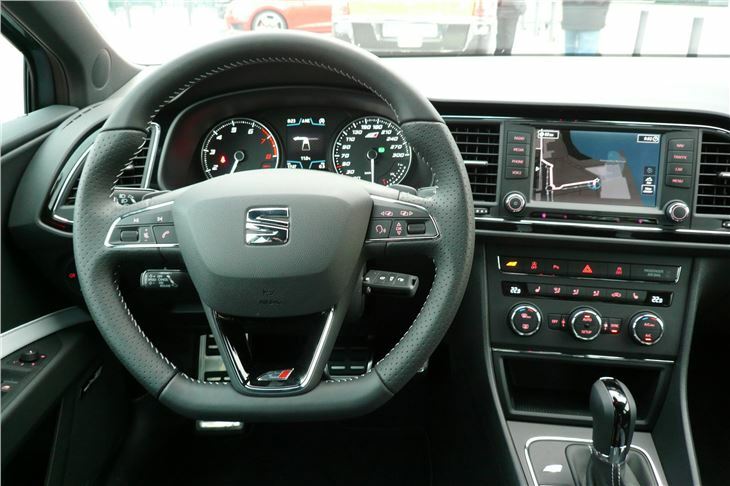 And if you select CUPRA on the Drive Profile menu you get the settings that Jordi Genet rated as optimum. All you have to do then is switch off the ESP and you can whack round a race track as quickly as your bottle will allow in seemingly perfect safety. Unsurprisingly, that’s exactly what we did. 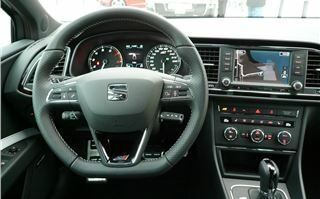 Other drivers preferred the 6-speed, wet-clutch DSG (the reliable one) for its faster gearchanges. But not me, because even in manual mode, it still decides when to change gear. So if you’re braking for a corner and it changes into 3rd a fraction of a second before you try to paddle-shift to 3rd, you get 2nd. Give me a manual, any day. Or a big digital display that tells me what the box is doing. The cars on the track were, of course, on the £460 optional road legal, super sticky Michelin Pilot Sport Cup 2 tyres. The next best thing to slicks. So, of course, they had something to do with the grip and controllability out of corners. But on the road the standard Bridgestone Potenza RE-50 235/35 R19s were fine for everyday use. I guess you’d have to make a decision here depending on how many track days you reckoned on doing. And the cost could add up: £28,505 for the basic, manual car. Plus £500 for the Colour pack to get stand-out wheels and mirrors. Then maybe £930 to upgrade the satnav. Then £1,250 to get the special one-piece seats. And would you want the £2,025 Sub8 performance pack to get the bigger brakes you’ll need for those track days? (In which case, forget the Colour pack because you get coloured wheels anyway.) Then £460 for the tyres. That comes to £33,170 without shelling out for adaptive cruise control at a further £505. On the other hand what else is going to do the job of hauling the family off on holidays and giving you a whole heap of fun on the race tracks? A Focus ST estate with its dogdy, substitute for a limited diff won’t. An Octavia VRS estate isn’t quick enough. 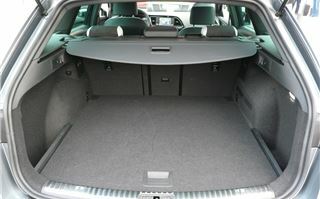 And a Golf R estate is likely to be a big fat wodge of cash more. The engine is VAG’s 2.0 litre EA888, that overcomes the old direct injected 2.0TFSI’s tendency to coke up its inlet valves. That’s why they added indirect injection, to clean the valves with the finest superunleaded before setting it on fire to produce 280PS and 350Nm torque all the way from 1,700 to 5,600rpm. The old engine’s tendency to use a lot of oil seems to have been cured as well because the EA888 has been under VAG bonnets for well over a year now with no complaints received on that score. The ST Cupra is a little bit low geared at 28mph per 1,000rpm in 6th of either the manual of the DSG. But it should still give you 35 – 40mpg which isn’t bad for a 6 second to 60 car with a top end of 155. 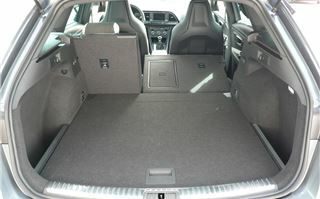 So if you, or your company, want a seriously quick load lugger that’s as at home on a circuit as it is hauling DIY stuff home from Wickes, the SEAT ST Cupra is your all-in-one car.